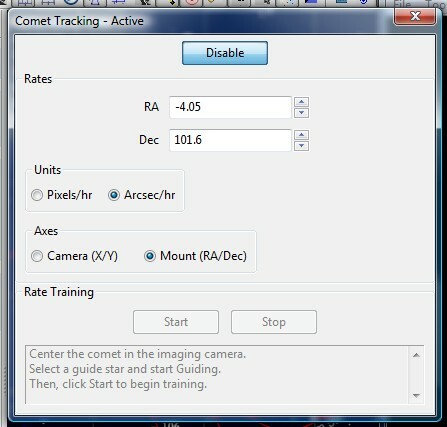 If you are already guiding on a star you just have to enable comet tracking. What will happens now is that PHD2 will start moving the star it's locked on at the same speed as the comet move relative the stars. You must have space around the star on the guide chip so it doesn't hit the borders. How long you can guide depends on the guide cameras FOV and the relative speed of the comet. For more far away comets I can guide for hours. I noticed a problem when I did a meridian flip of the telescope, it cause the rDEC rate to be of wrong sign, in EQMOD there is setting to let EQMOD send over which side of pier the telescope is. But there is little bit confusing about this. It's very important to have the latest version of EQMOD, v1.28m or later. I will give more instructions later when I collected more experience. It's only when pointing to East (northern hemisphere) with the telescope the sign of rDEC get wrong. 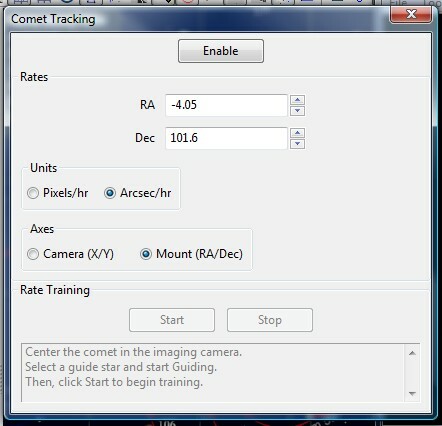 You can also change it manually in the PHD2 comet tracking window if you don't succeed to setup EQMOD correct.